and love Him more deeply? 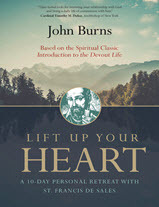 This year’s small group study focuses on a 10 week personal retreat with St. Francis de Sales and is based on the book “Lift Up Your Heart” by John Burns. Listen to Fr. Bline’s introduction to our fall book study. These ten meditations are designed to logically build on each other. In the ninth meditation we compared the anguish of Hell to the beauty of Heaven. Based on that comparison we were asked to choose between the two. There must be more to it than checking off the box titled “Heaven!” Of course, there is! In this final meditation, we look at the life that is directly associated with this choice, as St. Francis calls it “the Devout Life.” For a final time, we are called to use our imaginations. We now examine the lives behind the Final Judgement’s sheep and goats. In pride they seek to distinguish themselves from each other. elderly. Laughter reigns, and an air of peace lingers. FOCUS: This is a daily commitment to growth through grace. How, in a little way, will I grow today? If this is a choice that I am to make each day then, what step can I take today? Can you recall 10 key words, one for each meditation? Can you associate a few thoughts from each of these meditations? If I make a commitment to meditate on one of these during the day, what simple event or trigger can I use to do so? A subtitle for this meditation might be, “Heaven Versus Hell, a Sales Pitch for Heaven.” St. Francis points to a powerful plea from all of Heaven who lovingly call us home. The purpose of this and the 10th Meditation is to help us make that choice (120). In this meditation, we compare the stark differences between Heaven and Hell. In the next meditation we look at the influence of the world in making this choice. We have used our imaginations in an attempt to qualify the extremes of two eternal realities, Heaven and Hell. St. Francis’ intention is similar to Mother Angelica’s quotation, “l intend to scare the hell out of you!” The truth of the matter is that we are, likewise, called to be drawn to the beauty of love. God longs for you (123). We are called now, based on these extremes, to make a choice by the commitment of our lives. This choice is not a simple nod of the head, but a decision proven by our actions. How successful have you been at focusing on a singular thought from these meditations during the work day? Have you found a “trigger” (i.e. every time I touch my keys) to initiate that thought? What makes the decision between Heaven and Hell more than just the obvious? Which of the following excuses could most likely cause conflict in the decision. My present lifestyle is acceptable. If God is a loving God then He would never condemn me to hell. Read and comment on 2 Corinthians 12:9. The depth and darkness of the previous two meditations quickly gives way as it’s emotional opposite becomes our focus (pg.107). We are now asked to consider the joy of Heaven (pg. 108). “This mystery of blessed communion with God and all who are in Christ is beyond all understanding and description. Scripture speaks of it in images: life, light, peace, wedding feast, wine of the kingdom, the Father’s house, the heavenly Jerusalem, paradise: “no eye has seen, nor ear heard, nor the heart of man conceived, what God has prepared for those who love him.”(CCC 1027) 1 Corinthians 2:9.” With this in mind Fr. Burns asks us to dare to imagine! Imagine the most beautiful landscape the mind can assemble. Every detail is absolute perfection (pg.109). Heaven is simply the state of being in which creation is perfectly in communion with God (pg.111). Absolutely nothing in all existence could be more pleasing (pg. 112). If being loved by others is pleasing, imagine how pleasing being loved by God totally is. Heaven cannot be a distant choice or a far-off idea. It must be a constant and ultimate goal (pg. 113). the difference begins to fades (pg.115). FOCUS – Watch carefully for the moments of joy and happiness today, and keep them close (pg. 115). Note that every joy and every good you encounter this day is potentially a foretaste of heaven. The use of our imaginations has changed over our lifetimes, i.e. Santa Claus. Do you see a place in simply, dreaming of change for the better? Can you see the need for a scientist to imagine or dream? Think about Martin Luther King’s “I have a dream!” speech, or JFK’s oration to place a man on the moon. On page 115, the “Act of longing” is mentioned. What are such acts based upon? In this meditation our imagination is invoked. We are asked to paint the most beautiful portrait of joy and to know that it is not even close to the reality of Heaven. Read 1 Cor 2:9 and Isaiah 64:4. Do you see the license to “dream!” in these passages? Our wildest imaginations cannot embrace the full terror of damnation. Picture your eyesight filled with terrifying images from which you cannot turn your gaze. Picture all of your senses filled likewise with their worst extreme. Imagine a city of sadness with only the sound of wailing, discomfort, anxiety, with never enough food, where no one dies. This city’s name is despair, an image of Hell. Here there is no hope. Any luck with your quiet place? Describe it. Have you been able to select thoughts to focus on and to reflect upon during your normal day? This meditation speaks to the life-changing impact of sacramental grace. How real is this in your life? Throughout the week, what ideas from this meditation did you focus on? Over 140 parishioners are attending this Book Study. Each week they are asked to find a quiet place and through a short prayer put themselves in the presence of Christ. For the remaining part of that week they are asked to reflect on thoughts from that meditation. Finally, they meet to discuss the meditation. If you aren’t attending these weekly sessions join us anyway by taking this bulletin, circling a few words from the list below, and over the next several days, using daily repetitive activities to spark a reflection on your circled thoughts. Some opportunities might be your coffee break, when you place your phone down, each time you open your wallet or purse. Start a process of daily reflection and make it grow. You might even try leaving your marked-up bulletin open on your kitchen table. By the way, you can find all the previous meditation briefs in the archived bulletins on our parish website. Thoughts for reflection on this meditation follow. Judgement is a direct result of our freewill to make choices. Ultimately, freedom means we are free to choose our eternal residence. Judgment is real and it is in our future and it is permanent. The thought of entering the kingdom of God once and for all lifts the heart. God has given us everything we need, by grace and by sacrament, to ensure that we may need never hear those words of condemnation. God’s only desire is for our eternal happiness. Do you think that you will be surprised by your judgement? In your own words comment to the meaning of the quote from CCC 678 above? The Gospel from the 27th Sunday in Ordinary Time speaks of a “hardened heart.” How does such a mental condition relate to our judgement? In the Third Meditation we heard, “Over time, the conscience has become numb, and sins have become many.” Can our indifference or hard-heartedness make us less culpable of sin? Did Christ establish a Church with the power to identify what a serious sin is? Who else would like to skip this meditation? Don’t do it! The queasiness that we may feel is a sure sign that we have an incomplete understanding of the purpose of our existence. This meditation takes a hard look at the finite nature of life here on earth and the expansive nature of infinite joy, excitement, fulfillment that is to follow. Some thoughts on this meditation follow. Meditating on our death may seem morbid or extreme, but it is not more extreme than ignoring it. We seek to control our lives, rather than being grateful for what we have. Death is truly the inevitable loss of all control, the source our discomfort. Turning over control to God gives us a true sense of freedom, joy and peace. It brings a natural understanding that so much of our seeking is of trivial value. Good works, love of God and neighbor, charitable acts, faith lived out, remain of value. Those who will truly remember us are those whom we have brought to a better place. Meditating on our last moments emphasizes the need for living a Christ-centered life, starting today. Every joy, every love, every communion, is simply a foretaste of what is potentially to come. Do you see meditation as a form of prayer that can fit into your normal prayer life? Is there a sense of our death being too morbid for reflection? Why? Is it possible that the degree to which we desire not to discuss our last moments of life is a reflection on our true understanding of our purpose? What do you think it means to turn over control of your life to God? What one aspect of my life would be the most difficult to turn over to God? We are asked to carry a thought from this into the day. Suggest a few! We hide our limitations in order to appear strong, attempting to meet secular expectations. When this is our priority we naturally allow pride to mask our view of God. Over time, our conscience becomes numb, sin grows, and remorse for it fades. Through humility, we can honestly return to our original purpose – centering our lives on God. The Eucharist and Reconciliation are primary sources of grace in this effort. Repent, be remorseful, and commit to reform through these sacraments. Do not dismiss your sin, but begin the habit of frequent examination of conscience and confession. In prayer, place yourself at the foot of the cross and see the reality of the Lord’s love for you. Have you found a quiet place to meditate? When and where? Name a few secular views, which distract us from our purpose. How can I fight this distraction? Can you design or suggest a better purpose in life than to know, love, and serve God? Is there a natural reluctance to talk about the reality of sin? Why is that the case? How do you feel about discussing the last hours of your life, your death? Does our reluctance to discuss these matters suggest anything about our understanding of our true purpose, or even a rejection of it? Seeing God as Our Creator in the first meditation leads to the realization that creation without purpose, as discussed in the second meditation, is illogical? In this third meditation St Francis, asks us to reflect on our natural tendency to be in conflict with that purpose. Pride has allowed us to create our own sense of worth. Through a good hard look at God’s gifts and the need for gratitude, we can rethink that purpose. It is common to embrace the idea that we are more independent than we really are. Pride is the primary reason for this position. Gratitude for His gifts helps us to realize a total dependence on God. Gratitude is an absolutely fundamental attitude for a devoted child of God. From the eyes given to read these words to the faith that causes us to do so, His gifts are bountiful! In the following few words, “Take whatever he gives and give whatever he takes”, Mother Teresa captures the heart of our true purpose. Look at Mother Teresa’s quote. Can you see in it an understanding of our purpose? What is the tie between gratitude and humility? What thoughts can I take into my day from this meditation? Discuss charisms. Do lay people have them? Name a few and consider how they can be humbly used to serve the Lord. Now, in silent prayer, consider a gift that you have. Thank God for it and make a commitment this week to use it for the Lord. Is my purpose, or my value, related to my productive social value? In this second meditation Fr. Burns has us look at our human dignity. We are asked to understand our purpose as associated with our creation as sons and daughters of God. Some of his thoughts follow. Our true worth and value is beyond our imagination. When faith becomes the center of our life our dignity gives us meaning and purpose. We can assess the depth of our faith by the degree to which God is the center of our pursuits. This depth comes about with prayer. Understanding our purpose suggests a necessity to achieve it. Q: Discuss how complacency can be a distraction to meditation. Q: How do you discipline yourself to do these meditations? Q: In the practical reality of planning everyday life where is faith in the mix? Q: What goal can I realign to be more directed to God? If you can’t attend our book study, why not just reflect on these thoughts over the coming ten weeks? This study can become an introduction to meditation, an integral part of daily prayer life. Fr. Burns suggests that we find a quiet place for reading and reflection. Place yourself in God’s presence, recall a short prayer such as ”Speak Lord, for your servant is listening.” Read the meditation, stopping to reflect on interesting points and take one of those thoughts into your daily routine. The First Meditation (“Creator”) brings out a number of helpful ideas. Everything that I touch today is of God’s creation. God is the sculptor of who I am to become. Without a humble spirit I will always think too much of myself. Q: Where is my quiet place for meditation? Q: To what extent does God play a role in my daily plans or actions? Q: In what actions today, or tomorrow, can God play a bigger role? Q: Is God the sculptor of my life, or am I? In prayer, identify my own limitations. Admit them and let the Lord lead me through them.